Home > Dental Care > Toothbrushes: Electric or Manual? Choosing the right toothbrush can make a big difference to your dental health. There is some debate as to whether it is better to use an electric toothbrush or a traditional manual toothbrush. Both types of toothbrush have their appeals, but is one type better than the other? As they pulsate several thousands times per minute, using an electric toothbrush can remove far more plaque from your teeth and gums than a manual toothbrush. Electrical toothbrushes can also be more effective in removing stains from your teeth. If you struggle to clean your teeth properly (and therefore do not remove plaque effectively), an electric toothbrush can help you to reduce the likelihood of developing oral health problems because of this. The electric toothbrush does most of the brushing for you. When it comes to choosing an electric toothbrush, it often pays to spend a little bit more money. You can buy electric toothbrushes for less than £10, but these are not always the best option. The more expensive models will often last longer before they need to be recharged and are more effective in the cleaning stakes. Sonic toothbrushes work in the same way as electric toothbrushes, but they have an additional cleaning mechanism. These types of electric toothbrush rotate even faster, which creates pressure waves in your mouth. This helps to remove more plaque from your teeth and gums. These tend to be considerably more expensive than other electric toothbrushes, and many people do not consider them to be worth the extra expense. Using a generic electric toothbrush and flossing regularly is usually enough to keep your teeth and gums clean and healthy. Applying too much pressure or brushing for too long can damage the gums and tooth enamel. Some types of electric toothbrush monitor how much time you spend brushing and alert you when you have gone past the recommended time. Some also alert you if you are brushing too hard. These are more expensive than basic electric toothbrushes, but they can be useful if you are naturally heavy-handed in your brushing approach. Some people are reluctant to use an electric toothbrush as they are afraid that the vibrating action will wear away tooth enamel. In addition, electric toothbrushes are too bulky for some people to enjoy using them. This can also make them difficult to use properly. As you cannot rely on vibrations and power to remove plaque, brushing with a manual toothbrush requires you to use correct brushing techniques to clean your teeth properly. See our article on “Effective Teeth Cleaning and Flossing” for more advice on this. It is easier to clean your tongue with a manual toothbrush. This is where lots of bacteria lives, and overlooking this in your oral health routine is one of the biggest culprits of bad breath. 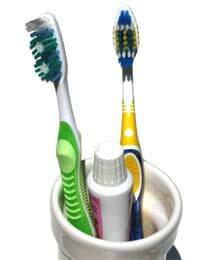 Regardless of whether you opt for a manual or electric toothbrush, the important thing is to use it effectively. See our article on “Effective Teeth Cleaning and Flossing” for more advice on this.